Across the USA, foreclosure sales are becoming an increasingly popular way of finding a bargain. Almost a third of properties on sale are now owned by banks, and as foreclosures - American for repossessions - continue, prices are being pushed down and driving an expansion in this niche market. 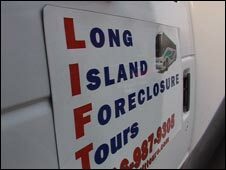 In Long Island one real estate company has set up tours of foreclosed homes to bring in the buyers. Punters on the hunt for a bargain are ferried around in a little bus to various foreclosed properties. The Long Island Foreclosure Tours started operating earlier this year. David Farrell is one of the partners. "Every day you see an increase in the share of the market that is foreclosure business and that is why we started this and got involved," he says. These are vacant houses that the banks need to sell and any buyer who is looking for a deal is looking for a foreclosure." This is a growing market, and there's not many of those to be had in the present climate. As a result of the increase in foreclosures, the banks now own almost a third of the homes on sale in America. It's a buyers market, if you have the money. 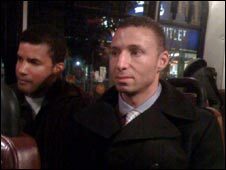 One of the clients on the bus is Andrew Hutchinson. He sees this as an opportunity to move up in the world. "With foreclosures you can find an area better than the area you live in now, and you can upgrade. Taxes might be a little bit higher, but you might have a house that you wouldn't be able to afford prior to this." One of the homes on the tour is a sprawling building with an outhouse. It's set on an expensive road in the neighbourhood. Last year houses around here were worth over $1.2m (£783,000). The bank bought this back for just over $1m. It's now listed at $699,000,a drop of almost 50%. The bank has had to bear a considerable loss. That's the irony; at the lower price, the former owners may have been able to afford the mortgage and stay in the property. Both the government and banks are working to staunch the flow of foreclosures, and keep owners in their homes, but critics say it's too little too late. In another part of New York, there's a seminar in the Bronx to help owners stay in their homes. At the public library, organisations wait for people to turn up. No one comes. A local official explains advertising budgets have been cut because of the crisis, and there was no money to spread the news. Rebecca Gamez was there. She's from the Neighbourhood Economic Development Advocacy Project (Nedap), a New York non profit organisation. "I think there definitely needs to be a push at the national level to make homeowners a priority, for those who are facing foreclosure to stay in their homes," she says. "I think that at the national level the government should be pushing banks and lenders to work with home owners, and get them into affordable mortgages so they can stay in their homes for the long term." In the meantime, the tour continues around the houses. As winter approaches they've started doing after work tours in the dark, which means the properties are being viewed by flashlight. There are five properties on this list. Mr Hutchinson shrugs his shoulders and says he feels bad for those who lost their home, but this is an opportunity. "Unfortunately due to the economy; foreclosed homes, you might say, are an economic change for some people and a benefit for other people," he says. "So we feel maybe we can get some good out of it for ourselves, some good comes out of the bad." Last month half of the homes bought were foreclosures. That's hardly enough to stabilize the market, but it does show that as prices fall, there is a market out there willing and able to buy.